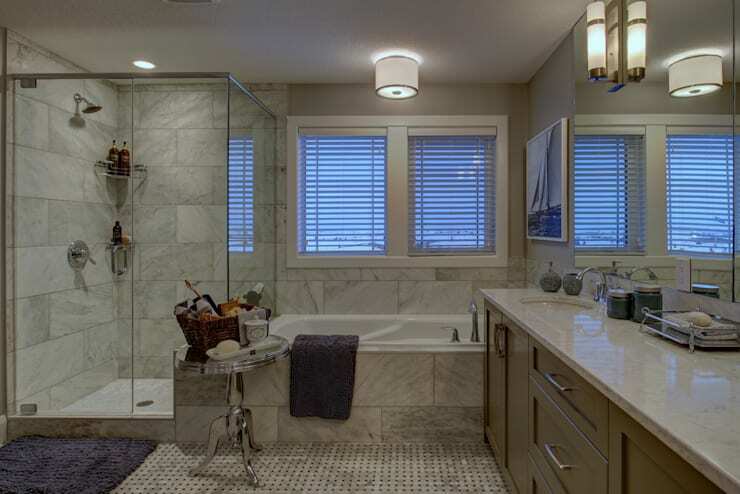 Bask in the relaxing atmosphere of these modern Canadian bathrooms! Polished floors, stone tile walls, beams of sunlight, sleek and sparkling surfaces… these Canadian design professionals have surely created some winners! This beautiful modern house cultivates an atmosphere of sophistication and cleanliness defined by open spaces and simple lines. A family of four lives in this home; the bathroom that you see here is the master bedroom’s ensuite. The floor-to-ceiling charcoal coloured tiles, along with the floating granite vanity, offers a “spa look”, turning the bathroom into a rejuvenating and decadent escape. Walnut cabinets and a mirrored medicine cabinet recessed into the wall offer extra storage, keeping the space clutter-free. This bathroom is small, but mighty. 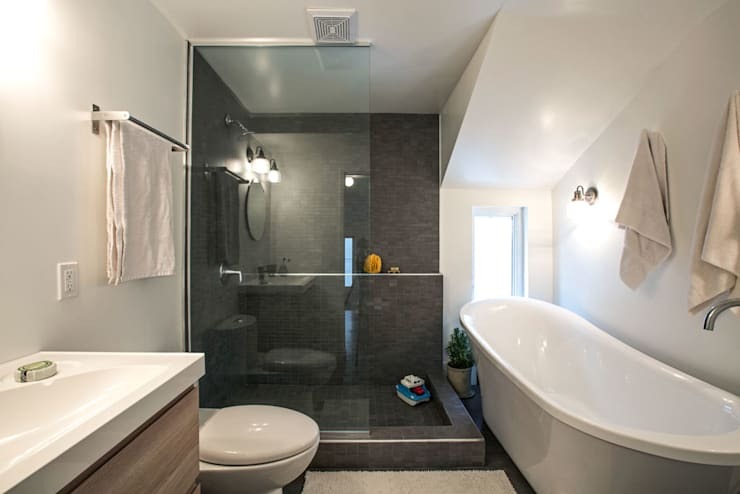 Most impressive is how the designers have managed to give the freestanding tub an appropriate amount of breathing room, creating a sense of a separate bathing area under the slanted ceiling and narrow window. This design takes advantage of existing light and dimensions, stylishly arranging all of a bathroom’s functional components into a compact space. 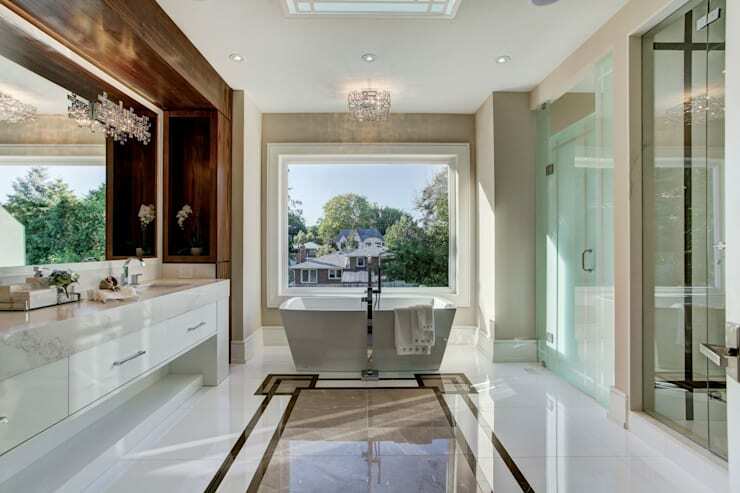 The bathtub sits front and center in this glamorous design! Grandeur is imbued into every detail of the room, from the ultra-polished marble floors to the extensive mirror to the small crystal chandelier suspended over the tub. Enjoying ample space, this room extends in an effortless manner, reveling in a sense of regality and relaxation. Near the tub, the white vanity offers up a scene like something from a 5-star hotel. An immense wooden “frame” visually anchors the vanity and recessed to the wall, providing storage shelves on both sides. 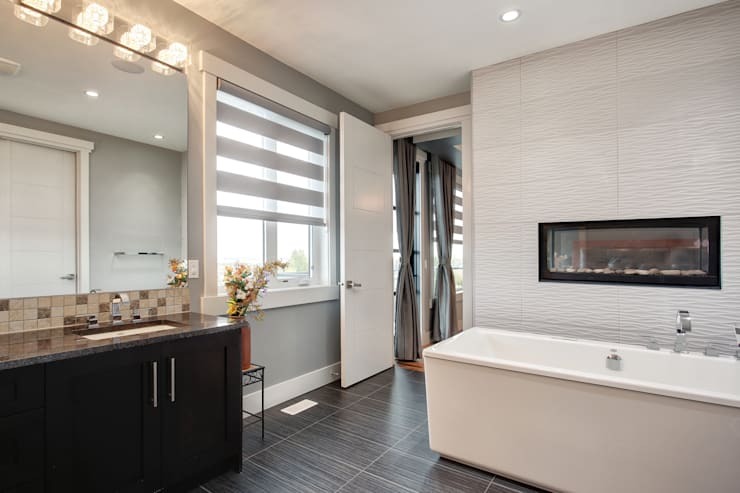 A practical space with a hint of luxury, this ensuite includes a small fireplace for creating a cozy sauna feel during those cold Canadian winters. This bathroom celebrates tradition with a patterned tile floor, with marbled stone tiles forming a practical waterproof layer on the walls that cover most of the room. This unusually sunny bathroom offers a crisp and bright environment thanks to a design that includes many windows! The large tub enjoys a little alcove at the end of the room, with a good balance between the privacy provided by the tile walls and the openness offered by the windows just above. This bathroom is part of a renovated 19th century Victorian home; the new design incorporates historical elements while offering a fresh, modern environment. 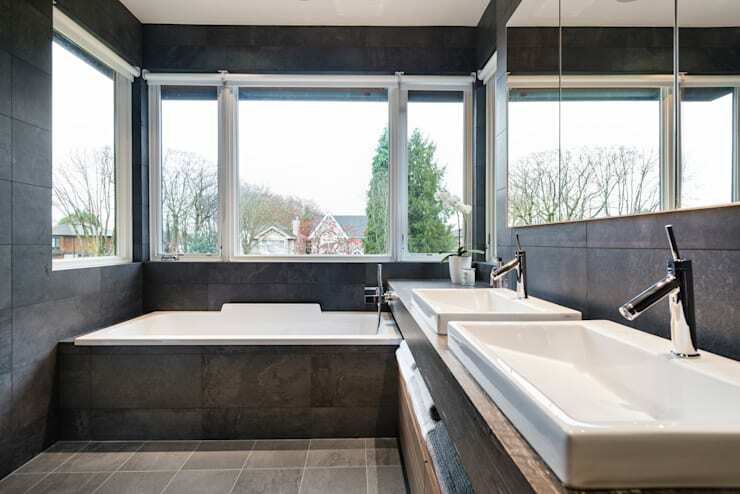 The bathroom honours the past with a freestanding design and classic black and white colour scheme, however, the space takes on a modern feel with the inclusion of a light-as-air glass shower stall, floating vanity, and a generally sleek, streamlined aesthetic. 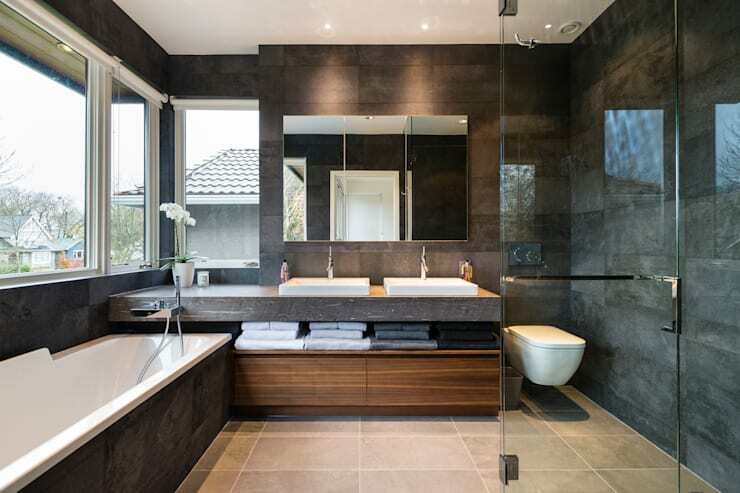 Share your comments on these modern bathroom designs below!